On the other side of an interdimensional portal lies the game world of Monster Realm, a place where monsters battle humans, where souls are held captive, and where Tom Hock, also known as, Combat Boy narrowly escaped. Now, he’s home and feeling safe—big mistake. Tom’s brother, Joey wants to play. He paralyzes Tom with a poison dart and reassembles the fabled monster token to start the game which spreads across San Diego. Now, Joey is the boss. 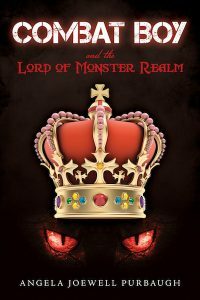 He makes the rules and designs the monsters, but what kind of game will a scatterbrained teen create? Tom charges through the game’s wacky, twisted, and hazardous levels, alongside a band of misfit gamers and vows to sacrifice his soul to save San Diego. But is that enough to beat the game, and stop Joey from unleashing his master plan of ruling as Lord of Monster Realm forever? This book is part of a series, and my inspiration came from book 1, Combat Boy and the Monster Token. I have at least five or six books lightly outlined in my mind. Yes, I outline in my mind (A kid goes into Monster Realm and has to come out with his soul) that’s the extent of my outlining. What happens in-between is a mystery to me, until I write it. I love that. Why? I want to be surprised, just like you do. I don’t want to be locked into one idea, plot, or formula. To me, that would be totally boring. I like it when the plot heads in a new direction because a character says or does something unexpected. Sometimes it’s frustrating, but mostly, I just go with the writing flow and enjoy the ride. The characters came straight out of book 1, Combat Boy and the Monster Token. That being the case, the minor characters who felt they didn’t get enough time in the spotlight in book, 1 insisted that I give them bigger parts in book 2, Combat Boy and the Lord of Monster Realm. Did I agree to their demands? Absolutely! I mean, why not? Crusher, Nitro, Lady Bloodsucker, X-ray, Zodiac, Viper, Metal Head, Pyromaniac, Doomsday and Avalanche were starved for attention and the limelight. However, they had to prove they were worthy of being in more scenes and having extra dialogue. And let the record show that that play worked like a charm. Seriously, as far as I’m concerned, the fact that they wanted to battle it out for center stage meant one thing: their passion and competitive nature would spice up my story and give it a fun and exciting energy. However, juggling all those characters as they traveled together through the Monster Realm wasn’t easy. It was a huge challenge to undertake, but a challenge I’m stoked I accomplished. Glancing up from my laptop, I saw Joey standing in my doorway. He still had on the costume that he wore in the Monster Realm game. It was a one-piece, green spandex getup that he’d become very proud of, despite the fact it made him look like a ridiculous vegetable. “Well, if it isn’t the notorious Green Bean,” I said, playing along. “What’s with the booty bag?” I asked, seeing that he’d added something to his screwball costume: a black fanny pack that was riding loosely on his hip. “Oh, all right,” I said. It had been nearly six hours since we’d played the dangerous game, and there were many exciting things to discuss. Without delay, Joey rushed over to my desk and sat in my black leather chair. He spun in it like a hyperactive child as I told my story. When I mentioned the tokens, he stopped spinning, sat up, and was all ears. At first, he seemed like himself: energetic, charming, and not at all whacked out on flower nectar. However, as I continued to talk about the tokens, their geometric symbols, and the way to put them together, the more Joey seemed to change. “I just need a few things, and I’ll be all set,” he said, with a sinister tone in his voice and a suspicious glint in his eyes. Immediately, a surge of adrenaline stabbed me. The tokens! On guard, I shoved off from the bed. At the same time, Joey raised a long red straw to his lips. It was the same straw he’d used earlier that night to guzzle a cookie-and-cream milkshake. Swiftly, he puffed on the straw, and something darted at me, a tiny dark flash of motion that hardly stood out against the shadows that filled my room. But there was no mistaking the sharp pain in my neck that followed. For a high-strung fourteen-year-old, Joey had the most remarkable aim. The dart struck my jugular vein. In disbelief, I yanked on the dart jutting out of my neck. Then I staggered and fell onto my bed. The paralyzing poison rushed up into my head and circulated back down my neck. In a matter of a heartbeat or two, I was out of action. I was dazed, numb, and paralyzed. Fearful, I choked, wheezed, and gasped for air. Grimacing, Joey said, “Uh…well, I guess you could die if you’re allergic. The whole alien poison thing, right?” Quickly, he put his ear to my chest, over my heart, and listened. “Uh-oh! It…it’s beating slowly, but it’s still beating. Yeah, I think you’re good.” After patting me on the head, Joey stood up and looked around my room. Excited, he danced across the hardwood floor with the skillful ease of a trained hip-hopper. After whirling on his toes and shaking his hips, he sang out, “Score!” He had found the five tokens that I carelessly left on top of my dresser. “This calls for a celebration, a little nectar of the game…Er, the last one,” he said, carefully pulling a red flower out of his fanny pack. He gave it a long sniff and then sucked it dry. I watched in horror as he snatched up the round silver dollar‒sized tokens. Each token was a different color: red, orange, yellow, green, or blue. Clearly, the answer to that question was all around me. I had a habit of leaving everything out. My room was a disaster. I had thought about cleaning it for, I don’t know, maybe half a minute. Relaxing, however, had seemed like a better idea, so that’s what I did. Hey, it takes a lot of time to recover from an active day like the one I’d had. I’d fought countless minions, killed four monsters, and beat the unbeatable game. Still, I should’ve taken the time to hide those tokens. If I were able to move, I would have punched myself in the face for that mistake. For a long moment, Joey looked like he had doubts about being able to put the mind-boggling token puzzle together. Puzzles were never his thing. Of course, that was then, and this was now. Being in the game had changed him. Perhaps, the game itself rewired his brain. Maybe it laid new high-speed tracks that fired sinister information into well-run locations in his normally disorganized noggin, information that would help him get what he wanted: flowers. Oh, how he hungered for their nectar, a sickeningly sweet treat that tasted like candy-coated love to him. Tragically, because of the flowers’ power, my brother, the once-goofy Green Bean, was now the mean, needy Greedy Bean. I could almost feel his frustration as he tried to figure out the puzzle. Then, he put his index finger in the center of the red token and pushed down on it. At first, nothing happened. Then, all at once, it began to flex, curve, and bend into a new curved shape. At the same time, thin, high-speed, computer-chip circuitry popped out, multiplied, and extended all around the token’s edge. Quickly, he pushed down on the other ones, and they took new shapes too. Fixated on putting the high-tech puzzle pieces together, Joey didn’t notice that my pinky finger moved. Yes, it bent ever so slightly. As soon as Joey flipped open the internal pivot mechanism on the red token and connected the other four to it, he twisted and turned the pieces clockwise and counterclockwise until click, they locked in place. The five tokens were now a single, seamless, digital 3-D globe. And within it, the holographic symbols—tetrahedron, hexahedron, octahedron, dodecahedron, and icosahedron—began to flash, one within the other, until a miniature replica of Monster Realm became visible. Slowly, the monster token floated up into the air, nearly brushing Joey’s nose. As it turned, Joey spotted the small USB port near its south pole. Right then, he knew that he needed an adapter to start up the game. Of course, I was no help, lying on the bed like a coma victim, a vegetable unable to speak. Slowly, Joey stood up. After thinking the problem over, he trotted over to my closet and picked my weapon off the floor. “Come to Papa,” he said, giving it a big kiss. The weapon was nothing short of amazing, with its intelligent and conscious black armor that could transform into anything imaginable. The lightweight titanium glove covered the user’s right arm up to the elbow. Sticking out of the fingers were long sharp claws. On the tip of one of the claws was a small USB adapter. As far as I knew, there was no way Joey could link up to my weapon. Only I could do that. I was the only one who drank its mind-connecting liquid before entering the game. Joey tried to slip the glove onto his hand, but he had trouble. Inwardly, I started to smile. But then, Joey’s hand sank into the glove, and it was a perfect fit. Wiggling his fingers, he waved the weapon’s sharp claws in front of his face. Appearing pleased, he turned and surveyed the monster token with a villain’s cold grin. There was no getting around the fact that I was now a mute vegetable watching Joey, the Green Bean, prepare to turn on the monster token and start up the game. If that happened, San Diego would be taken over by Monster Realm, and nobody would be safe. Joey was persistent; I’ll give him that. He was focusing on the weapon, willing it to link up with his mind, but fortunately, nothing was happening. I could see it in his eyes; the lunatic was at his wit’s end, and he was desperate enough to do something sick and twisted. He looked at me and bit down on his lower lip, thinking something over. As far as I could tell, the poison in my blood had no effect on him. Except, it apparently did make his tongue and lips go numb. In typical Joey fashion, he stuck out his tongue and blew one raspberry after another until the feeling came back to his mouth. Then he focused his attention on the weapon. “This better work,” he said. I closed my eyes, hoping the small amount of blood he got from me was not enough to link his mind to my weapon. “Come on,” Joey said, frustrated. I opened my eyes, expecting to see that the weapon was useless. Then I heard it beep. The thing I feared most was happening! Joey shifted his eyes over to me. “Ha-ha! You didn’t think I could do it, but look at me,” he said, gloating. “I’ve got the power!” he sang as he danced wildly around the monster token. Once he calmed down, he said, “Tom, to be fair, I’m going to give you something of mine. Think of it as a going-away present, an added perk for the game.” He lifted his hand and sliced the top of his index finger with one of the weapon’s blades. I cringed on the inside as he stuffed his finger into my mouth and wiped his sweet, syrup-flavored blood on my tongue. After a few disgusting moments of tasting Joe’s bloody finger, I started to feel the nectar’s power. Sweet Lord Almighty! I thought. What can pure flower nectar do? I tried to spit the blood out, but it was impossible. “Stop,” I managed to say loud and clear. Joey paid me no attention. Instead, he focused on my weapon, and it suddenly responded. Taking action, he moved in front of the rotating monster token and carefully inserted the adapter into its USB port to get the game started. For a moment, the room began to spin, and I felt sick to my stomach. Anxiety was flooding my mind like a fast-moving tidal wave. That or the alien poison was spiking to new dangerous levels. Whatever the case, I was in bad shape. Not only was the paralyzing poison making me feel weird physically, but it was also heightening my inner wisdom in an odd way. Right then, I knew that I needed a miracle, or at least the Jolly Green Giant. Yeah, the Jolly Green Giant would work. After all, he’s in charge of all the veggies. It’s his duty to step in and take care of any veggie trouble—and the Green Bean was starting big trouble. Fearing that I was losing my marbles, I thought about something besides the Jolly Green Giant. Unfortunately, those new thoughts were even more insane. Start the game! Hurry up! I can’t wait to go back to that twisted world infested with monsters and get my hands on some flower nectar. Fighting those crazy thoughts off, I used great force to turn my attention back to Joey. He was speaking to the monster token, telling it what to do, and it responded. Suddenly, it glowed brilliantly. Then, from on top of its north pole, a mysterious, colorful force, like Earth’s aurora borealis, concentrated into a spectacular laser beam and went straight through the ceiling. Although I couldn’t see the path the laser beam was taking, I knew that it was racing downtown, toward the convention center. And because the beam was traveling 186,000 miles per hour, it was probably already there. It was most likely in the secret underground, blasting the game portal. Yes, in my bones, I could feel the portal’s power switch flip on. In a flash, the laser beam shut down. At the same time, the monster token broke apart and fell to the floor. In a frenzy, Joey shook his head as if bugs were burrowing into his ears. He staggered back a few steps and then fell on the bed, nearly landing on me. From downtown San Diego, the hum of the game was rising in pitch. A moment later, the lights flickered off and on. Then darkness swept across the city, and dread filled me, as the lights outside and inside the house blinked off. Fortunately, the moon’s bright silver light illuminated my room through the windows. “What?” I managed to say in a whisper. Turning his head to peer at me, Joey said with a sneer, “I’m not talking to you.” He cocked his head up and listened attentively to an invisible being. “Oh, wow! I would love that,” Joey replied. “Yes, I’ll be ready.” He jumped to his feet and scooped up the five tokens from the floor. Surprisingly, I could move my hands and wiggle all of my fingers. If the dart’s poison were to wear off fast enough, I could stop Joey and switch off the game. I was stunned. Couldn’t believe this was happening. I mean, for as far back as I could recall, Joey and I were the best of friends. We spent countless hours playing in the backyard, bodysurfing at the beach, and building forts in the canyon near our house. He taught me fantastic things like how to crack my knuckles and make funny fart sounds by using my hand and armpit. And no matter how much we got on each other’s nerves or argued, we’d work things out and stay buddies. So, of course, it was disturbing and painful to think he’d betray me like this. But here we were. As I watched Joey leave my room, I tried to go after him, but my body didn’t obey. My legs were still useless, so I pulled myself off the bed using my arms. After landing facedown on the floor, I began pulling and dragging myself across the room like a legless lizard. As I approached the hallway, I felt that danger was nearby. I glanced out the bedroom window. Outside, a shadowy figure nearly eclipsed the light of the moon as it spread its massive wings and effortlessly soared into the night sky. Once in the hallway, I quickly pulled myself toward Joey, who was shouldering a backpack and heading for the front door. Suddenly, overhead, I heard rustling wings and a hard thud on the roof, followed by a terrifying shriek. I called for Joey, but he didn’t respond. Instead, he opened the front door, stepped outside, and slammed the door shut. Even though my body felt incredibly heavy, I managed to drag myself to the front door. Using the doorknob, I pulled myself up onto my knees. Some of the feeling had returned to my legs, and I managed to steady myself while opening the door. After attracting Sidewinder’s attention, Joey took a few steps back and patted his legs, encouraging the beast to come to him. The powerful creature snarled gutturally, and the rafters creaked as it slowly moved down the roof. I had learned a thing or two about the unholy from playing the game. The demon creatures were at least seven feet tall and looked like a combination of a lion, a bat, and a gorilla—not a friendly animal that you’d play fetch with or ride like a horse. I heard the sound of beating wings as the hideous demon swooped down from the roof and banked sharply in a flying turn. It moved with a sleek agility for a creature with its great mass. When it landed, its back claws scraped the driveway. The sound was like nails on a chalkboard. After screeching to a halt, the demon flapped its wings and stood in an upright posture in front of Joey. Wisps of rancid breath hissed through its jagged teeth, and hunger smoldered in its red eyes. Clearly, it had enough strength in one paw to rip Joey in half. If Joey was frightened by the monster’s horrible appearance or repulsed by its foul smell, he never showed it. “Sidewinder, take me to the game portal,” he commanded. Like most monsters, this one had a nasty disposition and a rebellious streak, and above all, it didn’t like taking orders. It dropped down to all four paws and stepped in front of Joey, snarling and leering at him hungrily. One thing was for sure—the demon didn’t like the idea of Joey being off-limits. It bared its teeth and readied for attack. Sidewinder shook its head and gave one last angry snarl before obeying. The beast lowered its body so Joey could climb onto its back. I staggered outside, hoping to stop Joey, but I was too late. Up into the sky they went, flying over housetops and tall trees.